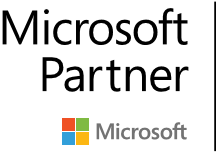 EBIS provides Power BI solutions for Deep Analytics: Real time data integration from various source that results in reports that will help businesses run more efficiently and allow them to make optimal and timely decisions. 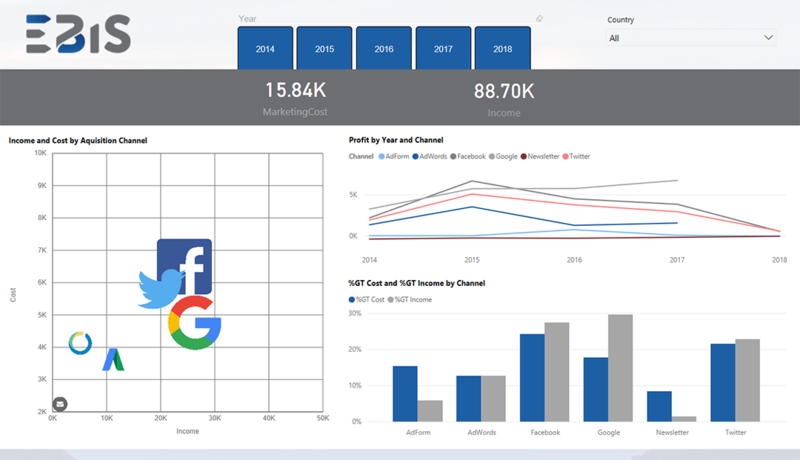 The Internet Sales Analysis dashboard demonstrates how Internet sales were changing over time considering six different acquisition channels for a company that produces various supplies. 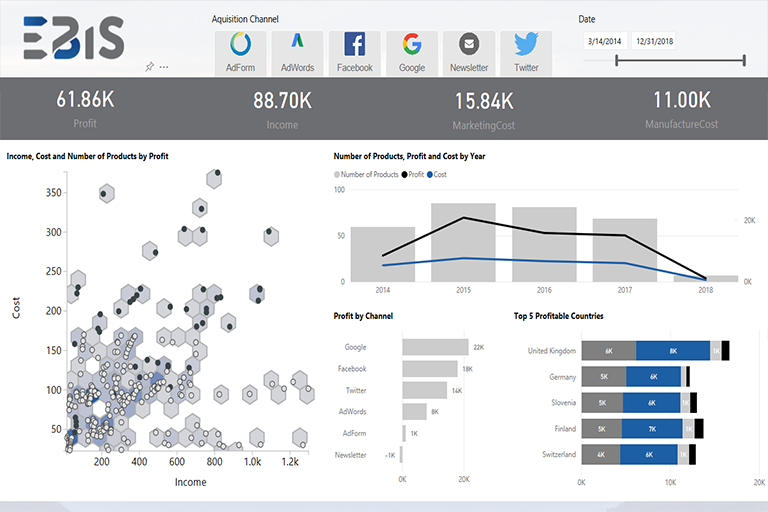 Power BI helps to integrate data from various sources, create measures that reflect the company's actual indicators, as well as making numerous, various and useful transformations to help visualize the actual performance of the organization. The first report page provides general information about company’s profit, income, and costs (both marketing and manufacture). 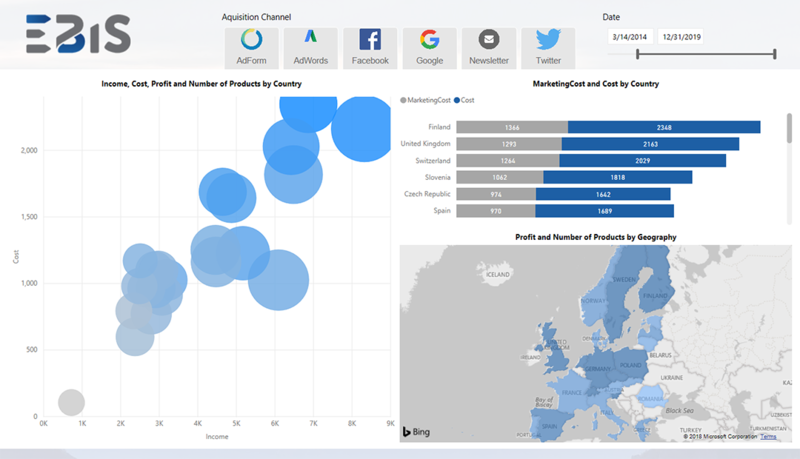 Visualizations show comparison of income and cost, how the number of products changed through years and profit that was made within each acquisition channel. There’s also a chart displaying the 5 most profitable countries profit, income, and cost. The report also demonstrates how the costs and profit of each marketing campaign changed through the years. These visualizations can assist management in making decisions about where to invest further, and where to reduce expenses. For example, profit obtained from Google searches is the highest of all and increases year by year from 2014 on with relatively low costs. Opposite to the Google’s case is Newsletter. The cost of that channel surpasses the income, making it least profitable. Also considered in this report is how sales were doing worldwide. Visualizations show income, costs and profits achieved in different countries. The data shows that the United Kingdom brought the highest income but also incurred the highest costs. All countries have a comparatively stable cost, income and product ratio which is forming a straight line. 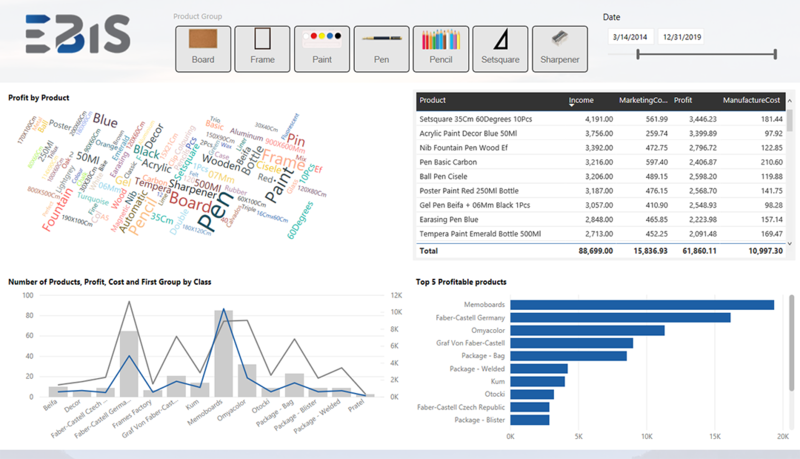 On the next report page, there’s analysis of the product. The report shows how well each product class is selling and the value of profit and cost for each class.